Tony Fitzpatrick is the Chair of Governors of Barr’s Hill School. He has been a Governor since 2014. Tony is a retired Senior Engineer, and worked for the computer manufacturer, IBM UK, for 35 years. He grew up in the South East, and was educated at a comprehensive school and sixth form in Essex, prior to studying Maths at Bristol University. He has lived in the Midlands since 1981. Tony is married to Helen, a former Coventry City Councillor and NHS Nurse. They have one daughter who is a Primary School teacher in Manchester. Tony is delighted to lead the Governing Body, and works closely with the Head Teacher, the staff, other Governors, and members of the Futures Trust, for the benefit of the school, its students and parents. 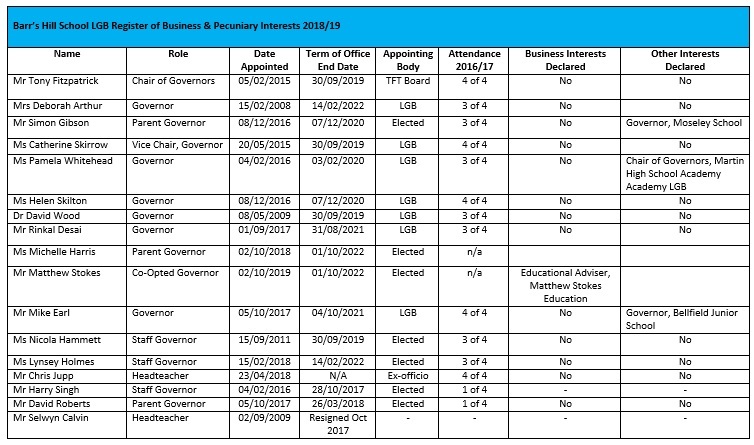 The Futures Trust’s Register of Interests captures relevant business and pecuniary interests of members, trustees and local governors of academies within the Multi-Academy Trust. Barr’s Hill School is a member of The Futures Trust, a Multi Academy Trust, a limited company and a charitable company registered in England and Wales. The trust’s company number is 8678162. President Kennedy School and The Futures Trust is authorized by The Secretary of State for Education and regulated by The Department of Education. The company is bound by the provisions of it’s Funding Agreement and the Education (Independent School Standards) (England) Regulations 2010. The MAT is one legal entity, a charitable company limited by guarantee. 1. Members, who agree articles which define the charitable purpose and how the MAT will run, appoint Trustees and remove if necessary, sign off company accounts and annual report and hold the Board of Trustees to account. 2. A Board of Trustees (Directors) who have ultimate responsibility for running each academy and will deal with the strategic running of the MAT. The Board delegates day-to-day running of each academy to a Local Governing Body (LGB). The level of delegation can be different for each academy. Accountability always remains with the Board of Trustees. 3. A Local Governing Body who have powers delegated by the Board of Trustees to oversee the day to day running of each academy. Annual funding is allocated to each academy on an individual basis. The MAT is a single employer, sharing procurement and resources across the group. In order to set up The Futures Trust, a number of legal documents are put in place between the Trustees and The Secretary of State for Education. A copy of the school’s Supplementary Funding Agreement can be found below.